Mostly official correspondence from Wood’s work as curator of the American Numismatic Society. Howland Wood became a member of the American Numismatic Society in 1909. By 1913 he had been appointed Curator, remaining in this position until his death in 1938. Collection open to all researchers. Howland Wood personal correspondence, 1873, 1902-1938, Archives, American Numismatic Society. Copyright restrictions may apply. Permission to publish or reproduce must be secured from the American Numismatic Society. Howland Wood was born in New Bedford Massachusetts in 1877 and graduated from Brown University in 1900. Wood became a member of the American Numismatic Society in 1909. By 1913 he had been appointed Curator, remaining in this position until his death in 1938. At that time, the Society only maintained a single curator, with two assistants. Despite the limited size of the staff, during Wood's tenure the Society's collections increased significantly, from 50,000 to almost 200,000 specimens. In addition to his curatorial duties, Wood also served as editor of the American Journal of Numismatics from 1910 to 1920. In 1920, Wood became only the third recipient of the Society's Archer M. Huntington Medal Award. Outside of the ANS, Wood also served as secretary to the American Numismatic Association from 1905 to 1909 and then as governor and chairman of the ANA's board from 1909 to 1912. After Wood's death, Edward T. Newell (ANS President, 1916-1941) eulogized Wood as "the ideal Curator," noting that "Howland Wood was one of those rare geniuses who combined an inherited urge to collect, an insatiable curiosity as to the 'why' and the 'wherefore,' and an orderly mind which could not brook obvious gaps or disorderly arrangement." Letters received by Howland Wood, with only a few outgoing, from fellow numismatists during his time as secretary, governor, and chairman of the American Numismatic Association (1905-1910) and for the first few years after becoming member (1909) and curator (1913) of the American Numismatic Society. Correspondents include A.H. Baldwin & Sons, S.S. Heal, Henry Chapman, Thomas Elder, E.H. Adams, George Heath, Farran Zerbe, the British Museum, the Museum of Fine Arts, Boston, and the Royal Numismatic Society. Topics include the development of Wood’s collection and collecting interests and articles he wrote for the American Journal of Numismatics and the Numismatist. This was a particularly turbulent time for the Numismatist as well as for the ANA leadership, and some of the correspondents are explicit in their opinion about fellow numismatists and other matters. E.H. Adams, Numismatist editor, mentions having “severed all diplomatic relations” with previous Numismatist owner and editor Farran Zerbe. 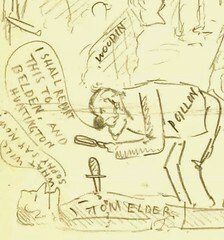 Regarding some New York Numismatic Club business, Thomas Elder calls Frank C. Higgins “more trouble than a bag of monkeys.” With the correspondence from T. Louis Comparette (1912) is a cartoon caricature lampooning Zerbe, Virgil Brand, William Woodin, and other prominent numismatic figures. Also found are the results of Wood’s civil service exam when in 1905 he applied for the position of curator of the numismatic collection at the U.S. Mint, a job that instead went to Comparette; an 1873 letter discussing Chinese and other far eastern coins; letters from Baumen Belden at the ANS, including ones regarding Wood’s appointment as curator (1912) and the buying of coin collections offered by Henry A. Ramsden, a topic also found discussed in the correspondence of John Robinson; the English translation of a portion of a German letter (September 9, 1914) from Dr. H. Nutzel to Wood assigning blame for World War I to England and Russia and listing atrocities committed by those countries; a long reminiscence by S.S. Heal brought on by the death of A.R. Frey (1926); a letter from Ruth Gaines of the Huntington Free Library and Reading Room, of which Wood was second vice president, objecting to the appointment of a library director (1933); a letter from H.O. Granberg of Oshkosh, Wisconsin, relating to gold mine investments available through Hahns Peak Gold Mining & Milling Company (1936); and letters from Wood to and from his Uncle George in which he mentions joining ANA and discusses his collecting interests and his intention to specialize. Also included are six files of at times very lengthy letters (1908-1914) from Henry A. Ramsden, owner and foreign manager of the coin dealership in Yokohama, Japan, that operated under the name of his brother in law, Jun Kobayagawa. Wood sometimes represented Ramsden’s interests in the United States, and the topics include Japanese, Chinese, and other Far Eastern coins; Ramsden’s travels in China; the Ro (also called Lo) collection of Luo Zhenyu, which was displayed at the ANS; and fellow collector Giuseppe Ros, Italian consulate general, Shanghi. Also present is an account book (1912-1915), along with some invoices, mostly documenting transactions pertaining to Ramsden and Kobayagawa, and a portfolio containing Wood’s certificate for joining ANA in 1902; a typed satirical poem, “Coin Collecting Carols or Pithy Poems for Pocket-Piece Pursuer’s Perusal,” naming George F. Heath, Lyman Low, Edgar H. Adams, Thomas L. Elder, and others; the text of a speech on coin collecting; an outline, “Some Reasons for a Numismatic Department in the Boston Museum of Fine Arts” (July 1903); and a photograph of coins displayed in a cabinet. See also Howland Wood curator correspondence and other material, 1913-1937. 1903 - Baldwin, A. H.
1903 - Frey, A. R.
1904 - Baldwin, A. H.
1905 - Dunham, W. F.
1906 - Baldwin, A. H.
1906 - Ezekiel and Bernheim Co.
1906 - Frey, A. R.
1907 - Heal, S. S.
1907 - Mitchelson, J. C.
1908 - Frey, A. R.
1908 - Gies, A. C.
1908 - Heal, S. S.
1908 - Low, Lyman H.
1908 - Treasury Department, U.S.
1908 - Webb, Percy H.
1909 - Adams, Edgar H.
1909 - Frey, A. R.
1909 - Tuthill, Luther B. 1909 - Webb, Percy H.
1910 - Baldwin, A. H.
1910 - Joseph Baer and Co.
1910 - Low, Lyman H.
1910 - Sears, Elmer S.
1911 - Adams, Edgar H.
1911 - Joseph Baer and Co.
1911 - Chapman, S. H.
1911 - Frey, A. R.
1912 - Adams, Edgar H.
1912 - Low, Lyman H.
1912 - Newell, Edward T.
1912 - United States Coin Co.
1913 - Adams, Edgar H.
1913 - Comparette, T. Louis. 1913 - U.S. Coin Co.
1913 - Webb, Percy H.
1916 - Adams, Edgar H.
1930 - Chase and Co.